The Economic and Organized Crimes Office [EOCO], has completed its investigations into the controversial $72 million digitization project executed by the Social Security and National Insurance Trust (SSNIT). According to the Acting Chief Executive Officer of EOCO, ACP K. K. Amoah, the docket has been forwarded to the Attorney-General for scrutiny and advice. EOCO started investigating SSNIT in August 2017 after it emerged that the Trust had injected $72 million on the procurement and installation of a software and other hardware systems known as the Operational Business Suite (OBS) to digitize SSNIT's operations. The Trust had been widely lambasted over the project which is reportedly not fully functional. The project included the installation of a software to ensure that its headquarters receives data directly from all of its offices. The Board Chairman of SSNIT, Kwame Addo Kufuor, in an earlier interview with Citi News in August 2017 confirmed that about 15 people appeared before EOCO as witnesses in the matter. SSNIT also contracted PricewaterhouseCoopers to conduct an audit into the contract. SSNIT further assured that it will publish findings from the audit by PricewaterhouoesCoopers into the matter. Amidst the controversy, it emerged that the General Manager of MIS at SSNIT, Caleb Afaglo, who was appointed to the position in 2015, did not hold the right qualifications. He was interdicted by the management of the Trust over suspicions that his Bachelors', Masters' and Doctorate degrees were fake . EOCO also reportedly interrogated members of Mr. Afaglo's household, and confiscated a number of documents belonging to him. 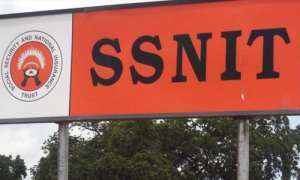 The Management of SSNIT subsequently said it was fully convinced that the degrees were fake and has therefore taken the decision to sack Mr. Afaglo. Mr. Afaglo's CV indicates that he acquired his BSC and MBA from the Georgia Institute of Technology, and a PHD from the Kennedy Western University, which was an affiliate of the University of Cincinnati until it was closed down in 2011.